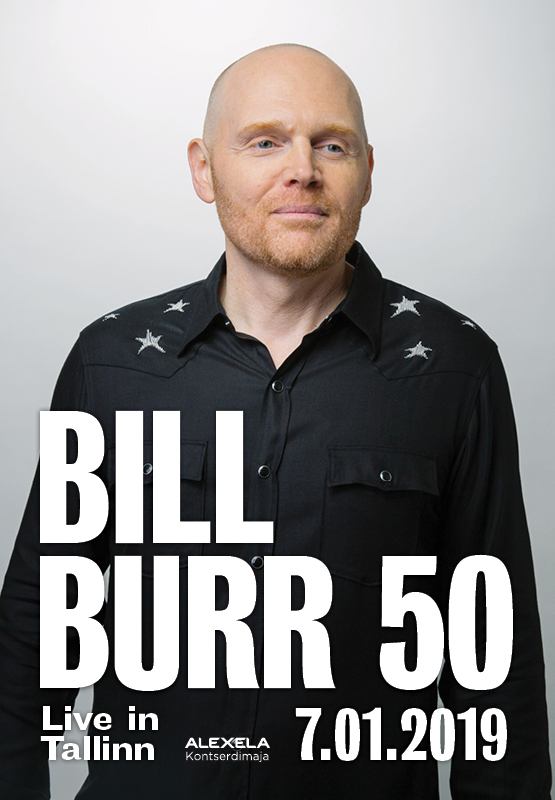 Komeediklubi is proud to present: Bill Burr 50, live in Tallinn. Bill Burr is one of the most comic voices of his generation - both on television, on the screens and live as a stand up comedian on stage. His shows are sold out worldwide and his Monday Morning Podcast is one of the most downloaded comedy podcasts on iTunes. In 2015, the US Comedian performed in the sold-out Madison Square Garden in New York in front of more than 20,000 spectators. He also celebrates success with his Netflix series "F Is For Family," whose third season will have its premiere later this year. The New York Times described Bill Burr as "one of the country's funniest and most distinctive voices" a few years ago. In the beginning of 2019 he will do a show in Tallinn for the very first time as part of his European tour. Alexela Kontserdimajas 7. jaanuaril 2019 kell 20, uksed kell 19. Bill Burr on üks meie põlvkonna koomilisimaid tegelasi — nii teles, kinolinadel kui stand-upi laval. Tema showd müüakse välja üle maailma ning tema Monday Morning podcast on iTunesis üks populaarsematest. 2015. aastal esines Bill Burr New Yorki Madison Square Gardenis rohkem kui 20000 inimese ees. Ka tema Netflixi seriaal “F is For Family” on üliedukas ning peagi tuleb välja selle kolmas hooaeg. New York Times kirjeldas Burri kui “ühte Ameerika naljakamaid ja erilisemaid koomikuid”. 2019. alguses annab Bill Burr oma Euroopa turnee raames oma esimese live-show Tallinnas.